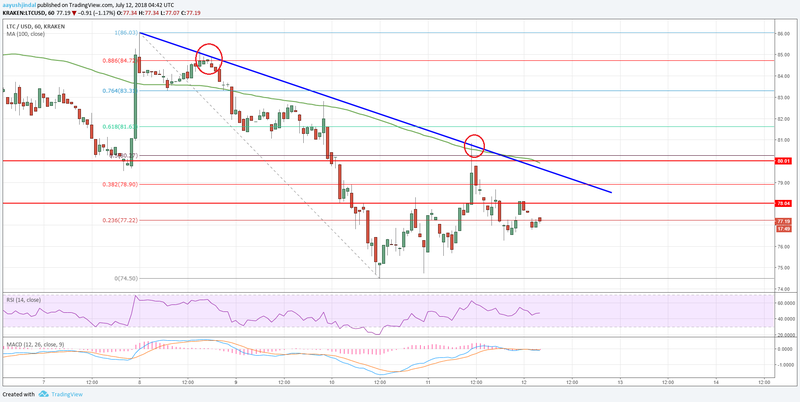 Litecoin price started an upside correction from the $74.50 low against the US Dollar. However, recoveries in LTC/USD were capped by the $80.00 resistance. Litecoin price moved a few points higher after forming a support near $75.00 (Data feed of Kraken) against the US Dollar. Yesterday’s highlighted key bearish trend line is intact with resistance at $79.00 on the hourly chart of the LTC/USD pair. The pair must break the $79.00 and $80.00 resistance levels to recover further in the near term. After a major decline, litecoin price found support near the $75.00 level against the US dollar. The LTC/USD pair formed a low at $64.50 and later started an upward correction. Looking at the chart, the price managed to move above the $78.00 resistance level. There was also a break above the 38.2% Fib retracement level of the last drop from the $86.03 high to $74.50 low. However, the upside move was capped by a key resistance near $80.00. More importantly, the 100 hourly simple moving average, which is currently at $79.95 also acted as a barrier for more gains. Lastly, yesterday’s highlighted key bearish trend line is still active with resistance at $79.00 on the hourly chart of the LTC/USD pair. A break above the trend line resistance at $80.00 and the 50% Fib retracement level of the last drop from the $86.03 high to $74.50 low is needed for more gains. The next hurdle above the $80.00 resistance is near the $82.00 level. On the flip side, if the price continues to struggle below the $80.00 resistance, it could move back down towards $76.00. Below $76.00, there is a risk of an extended decline towards the $74.50 low. Any further decline in litecoin price depends on how buyers react if the price retest $65.00. Overall, the LTC/USD pair is currently trading in a range and if buyers succeed in clearing $80.00, there could be a decent recovery towards the $82.00 and $83.00 levels.